What is it about old chippy painted pieces that always draws me in? I love the old feel, the idea that they have been well loved and used and there is a secret history behind each piece. 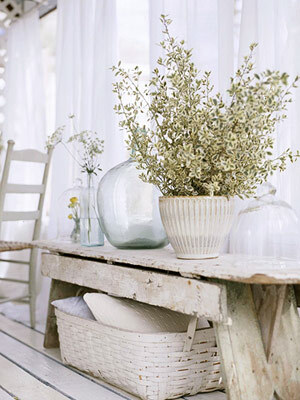 I love everything about this photo, from the shape of the windows, to the vintage basket, to the old worn table. A wonderful combination of fine silver with the primitive. 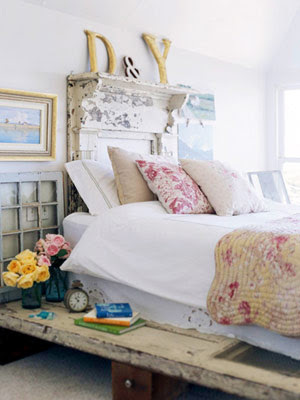 Here an old worn mantle serves as a headboard. An old chippy iron baby bed repurposed into a daybed/couch. Just the photo on FB drew me in and had to check out the post asap. I love chippy paint...you are so right about the old feel. Its romantic, aged, pretty, vintage and just plain yummy! 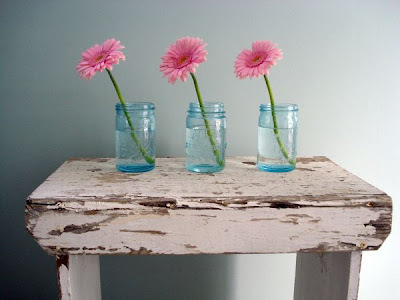 Great visual inspiration....I just painted 2 nightstand in Olde White Chalk Paint and did it very liberal and messy so that it would chip, wear down and I will have lovely chippy pretty nightstands. Come visit my blog on Friday when I post them. As always I love stopping by...Ive been MIA for a bit but Im back and happy to see what your up too! I love the weathered look! I just recently whitewashed an old headboard and sanded some of the paint off for our beach-themed guest bedroom! I'm subscribing so I can see your updates! Can't wait to feature you on my blog! Laura, I stalk articles about the house in San Francisco that the second photo is from. I love it!!! :D This is an *awesome* post. I love all things white and chippy!!! These photos seem so restful to me. Quite and calm. Just what I need most of the time. Oh, yes, yes, and yes! Lovely visuals, so refreshing, cool and inviting... which I certainly need on this 110+ degree day! *Whew* What I Love most about Chippy Paint now being on trend, is that those lovely aged to perfection Patinas are now being preserved and appreciated rather than stripped and painted over!